The House is situated 33 km. away from the Colombo International airport. 10 km. away from the Colombo City. 3 minutes walk to the Restaurants. Hotels. Take away outlets. Pubs. Odel. Clothing Store. Super Markets. KFC, Burger King. Places of Worship. Banks. Bus Stop. Taxi Stand. Galle Road. Close to the Railway Station. 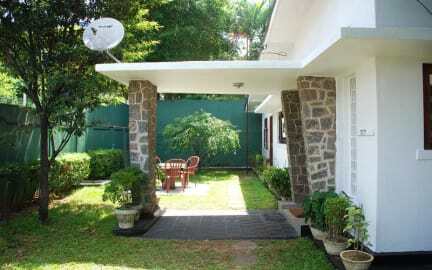 It is situated in a Tourist Resort and a Good Residential Area. The Rooms are with en-suite Bathrooms (Hot and Cold water). Ceiling fans. A/C on request. The Rooms are furnished with two twin beds, table, two chairs, a cupboard, one fridge. There is a Common Pantry. A Dining Room. A Living Area. A TV Room (satellite). Internet. WiFi available. Garden provided to relax. Inclusive is: Electricity. Water. Bed Sheets and Towels. Air Conditioning - Three A/C Rooms Available. Mt. 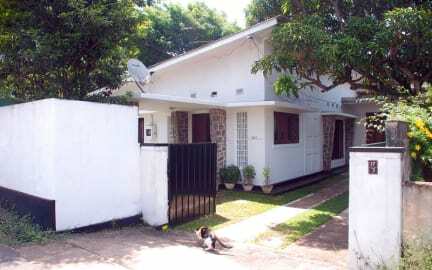 Lavinia Home Stay was perfect for me and my family as it is close to a very beautiful, clean beach and south of Colombo where there is a little less traffic. There are many shops and restaurants within a couple of blocks from the Home Stay, so it was convenient and yet also very quiet. We were able to use the kitchen at the Home Stay as well, which helped when we didn't want to eat out. The proprietors were very kind and helpful. Altogether a very pleasant place to stay! Priyanka a welcoming and thoughtful hostess. Good sized private room with all needed amenities. Special attention to my internet needs. And a good spotless kitchen. Close to beach and a good range of eateries. The perfect place to stay while in Colombo, around 30 minutes by bus away from the city center. The beach is very near and the atmosphere in the homestay and around is very pleasant. There isn't a whole lot of interaction with the owners that would be assumed by a "homestay," it is really just a hostel and it's fairly outside the city. However it is a great value, the owner's are kind, the rooms are clean, the WI-FI is great, and there is A/C for an extra charge if you want it. Perfect for the solo or companion traveller that wants a private room for the best value. I surely do recommend! Great host- very kindly let us use the room the day we checked out until we left for the airport at 8pm as she had no one checking in that day. Also kindly washed our clothes for us at no charge. You are left to your own accord which is a lovely respite, no selling! Cleaned room when asked, aircon available if needed. A very timid but beautiful tortoise in the garden! I would recommend the Road House van for kottu at the top of Hotel road a couple of hundred yards away- fantastic food! Bit far from Pettah, bus 1 hour. Train 20 minutes but do not do it in rush hour! Nice lady, basic room. There is a lounge, small garden and kitchen. Expensive food at beach, much cheaper in Colombo. It was a good place for an overnight. This is not a hostel but a private residence so there is really not atmosphere to be had here. The owner is nice but clearly would not appreciate noise or party type travelers here. The wifi works great but A/C is extra. There was hot water available. No meals served but there is a kitchen and the place is like 3 minutes from the beach where there are food options.